Looking for a fun family outing near Ramstein Air Base with the kiddos? 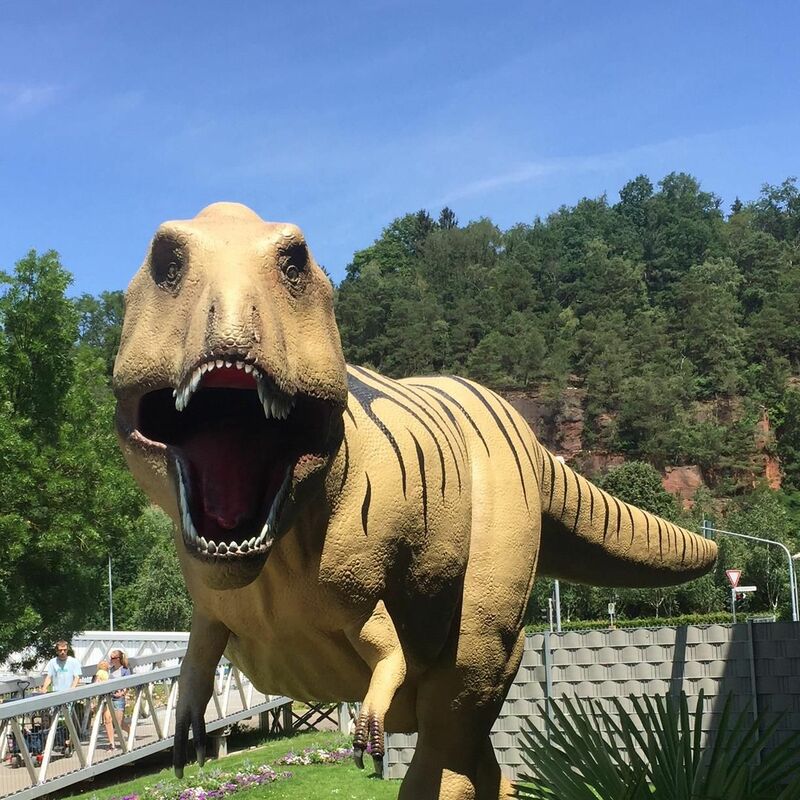 Look no further than the dinosaur park in Kaiserslautern. This Park has plenty to see and do. There are Dino statues, water play area, creeks, play grounds, skate park, beir garden, and plenty of walking/hiking paths for beautiful scenery. This is a popular location for locals during nice days. Although popular, this park has plenty of room so no worries of not being able to find your family a place to claim and spend a few hours relaxing or exploring. There is a small fee for entry into the park for children 6 and older. Kids 5 and under are free making this an extremely budget friendly outing for parents with younger kiddos. The dinosaur area is both enjoyable and educational for all. Signs are in German and in English, so no need to worry about not being fluent in German to enjoy this adventure. On hot days, beat the heat playing in the creeks or in the water play area. Parents don’t forget a towel as one will definitely be needed. I also recommend a change of clothes for after the fun is finished. Do you love flowers? There is plenty of scenery to explore. The only downside is all of the signs for the different flowers were in German only. No worries though, you can still enjoy the beauty even if you don’t know exactly what flower you are viewing. The beir garden had more than enough bench seating so there was no problem finding a spot at a table to have lunch. The food was hot and the drinks cool. If you are already in the neighborhood, I would say this park is worth the visit. My sons enjoyed all the activities and kept asking to go back. One last tip, the signs to find this park are labeled as Japanese Garden not Dinosaur Park. Signs are also in English when you get close up. This is the timeline of the history of the world. Splash Mountain – Kaiserslautern style; Lots of ways for the children to get wet! Super Duper Slides — You won’t find this in the US of A!